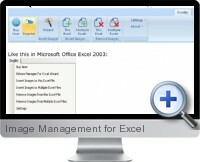 Excel Image Management (Picture Manager) is an Excel add-in providing automated tools to import and manage images with Excel documents. Batch image inserting based on references within the worksheet dramatically saves time when creating catalogs and picture based publications and reports. Image resizing to cells and image file name matching eliminates errors and ensures professional design for resulting Excel documents. Images can be inserted by either browsing to the image file or refereeing the file name in cells. Imported images are resized to fit cell dimensions including merged cells. Insert multiple images to multiple workbooks in batch processes. Automatically remove all images from a single worksheet or multiple workbooks. Advanced setting menu allows the specification of preferences when managing images in Excel.